Carl Fischer first released the Kopprasch studies for horn in 1939. 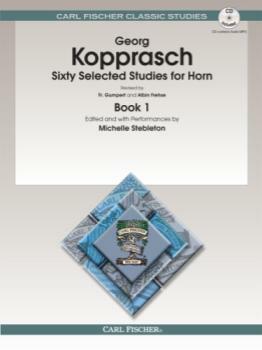 More than seventy years have passed, and the Kopprasch studies have remained standards of excellence for all serious horn horn players. For this reason, Carl Fischer has prepared a newly edited and engraved version of the first book of Kopprasch’s seminal studies. This revised edition includes a CD that contains MP3 recordings of all thirty-four studies in Book 1, performed by Michelle Stebleton, Associate Professor of Horn at Florida State University. Now students can use these recordings as references for tempo, phrasing, and articulation when practicing. For intermediate players.